Does it seem like your home’s air conditioning always unexpectedly breaks on the hottest summer day? At A/C Contractors, we fully understand Longview and Tyler, TX homeowners can’t predict or control what time their air conditioning unit stops functioning, and that’s why we offer all local residents responsive and dependable emergency 24-hour repair services. Our knowledgable and experienced repair technicians can inspect and perform repair services for any type of cooling system your home has, including central air conditioning systems, heat pumps, ductless mini-splits and thermostats. Make sure you’re never caught at home during a sizzling summer day without proper air conditioning with the help of the trained and certified emergency repair technicians at A/C Contractors. For all of our emergency service calls, our technicians arrive promptly and perform a complete inspection of your cooling system to quickly diagnose the cause for your malfunctioning system. We’ll develop a comprehensive repair plan with personalized solutions to restore the operations and performance of your air conditioning system. Guidance from trained professionals, so you can make well-informed decisions that best suit your family’s needs. Guaranteed emergency repair services, completed properly the first time or your money back. Lack of Maintenance: Having a properly maintained air conditioner is the best prevention method for emergency repair visits. Regular maintenance tasks can prolong the lifespan of your cooling system, highlight potential repair needs to reduce emergency costs and improve efficiency. Aging A/C System: Even with proper maintenance, aging air conditioner units will begin to wear and fail. As your air conditioner reaches the end of its usable lifespan — approximately 15 to 25 years for most systems — consider upgrading your system to a modern and more effective solution. Also, determine your repair costs — if the total repairs are beginning to exceed the total value of your A/C system, then you may benefit in the long-term from a system replacement. Overworked Air Conditioner: During the summer months, your air conditioner is working hard to keep your home at a comfortable temperature. If your system needs frequent repairs or costly emergency attention, consider if your A/C unit is being overworked — turn down your thermostat during certain times of the day, shut off the system when you’re away from home and improve old, damaged insulation and weatherstripping around your home. When you need reliable and responsive Longview 24-hour A/C repair, call the professionals at A/C Contractors. 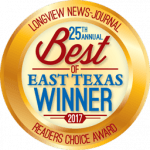 We have more than 25 years of experience working with homeowners throughout Longview and Tyler, TX to complete all of their air conditioning repair, maintenance and installation needs. To schedule emergency air conditioning services, fill out our online contact form or call 866-427-7689 to speak directly with a team member.